For a long time I have revered the warm and respectful friendship between two of Russia's greatest composers: Sergei Rachmaninov and Nikolai Medtner. The support and encouragement that Rachmaninov offered to his friend and colleague during the periods of tormenting self-doubt were always reciprocated by Medtner, as witnessed by many letters. Unfortunately the latter never came close to attaining the same level of recognition as Rachmaninov, either during his lifetime or since. Rachmaninov recognized his gifts early enough, however, pronouncing Medtner the 'greatest composer of our time'. The most sincere testament to this unique friendship is embodied in these two piano concertos, which the composers dedicated to one another. Not exactly heaven-like, the C minor opening of his Second Piano Concerto (composed in France in 1926/27) makes it immediately clear that despite the dedication to Rachmaninov the piece is in no way a pastiche, but rather a tribute or 'musical letter' from an individual of equal stature. The first movement 'Toccata' is written in sonata form, of which Medtner was a true master: his teacher Taneyev frequently exclaimed that Medtner was 'born with sonata form'. (This aptitude was one that I think Rachmaninov sometimes struggled to emulate, resulting in obsessive revisions.) As with Bach's or many of Chopin's compositions, it is almost impossible to add or take away a note (at least on purpose); when you play works of this kind you have a feeling that they are blessed with a perfect touch. Not a single note appears superfluous (a word Rachmaninov dreaded, yet used frequently when describing some of his own early works,). Like in Brahms or late Beethoven, such terms as 'melody' and 'harmony' are basically interchangeable and are all in aid of the form, Medtner's Holy Grail. 'Melody...should actually be viewed only as a form of the theme. Form...is harmony. Form without contents is nothing but a dead scheme', Medtner wrote in his book The Muse and the Fashion (which Rachmaninov helped him publish). After the concerto's rather militant opening, where typical Medtnerian rhythms are immediately recognized (from the way rests and off-beat accents are distributed, reinforcing the pulsating nature of the phrases), one gets a good sense of the fatalistic character of the piece - in case one hasn't already been hit on the head by the key of C minor. But soon, through the E flat major of the second subject (molto cantabile), an expansiveness and a penetrating lyricism of the kind that brings back memories of the great Russian landscapes (dear also to Rachmaninov) begin to resonate strongly, before accelerating and turning into hunting calls when a third subject is introduced in the piano, followed by strings (al rigore di tempo). Like Rachmaninov, Medtner was a great pianist, as shown by various recordings, and the massive cadenza in the first movement features some of Medtner's most ambitious piano writing, elaborating all previously encountered ideas. What's immediately noticeable is that, no matter how difficult the writing, the notes - and there are always many - lie extremely comfortably under the hands, and that each note is essential, always serving the development of thematic material. The slow movement, Romance, is in A flat major and has a ternary form with a stormy, quasi- rhapsodic C sharp minor Agitato section. In structure, it is very similar to the second movement of Rachmaninov's Fourth (in terms of its length and effect, however, Rachmaninov's middle-section - even in its original version - is more of a melodramatic burp, when the grumpy and indiscreet sounds originating from the brass come up violently in waves.) The main theme begins in thirds and of particular interest is the phrase with the falling fifth (C - F), which starts in the piano and is continued by horn, clarinet, basses and first violins in succession. This interval recurs throughout the movement and is probably the main source of the warmth that radiates from it. In the recapitulation, beautiful silky textures in the right hand complement the more velvety sounds coming from the main theme in the strings. The transition into the last movement is rather unusual; after the exultation of the climax, the trumpet, in a foreshadowing of the theme of the closing movement, announces a new interval (E - D). This is immediately taken up by the piano, which ends the movement with a jazzy flourish while the strings uphold a harmonic ambiguity, which is resolved into the dominant once the C sharp squeezes itself into a D. To my mind, the only other similarly magical moment appearing between movements is in the transition to the finale of Beethoven's 'Emperor Concerto'. The exuberant (even by Medtner's standards) final movement is a Divertimento-Rondo, exhibiting a wealth of references not only to previous movements (with the themes inverted, retrograded, augmented, modulated, intertwined and a lot of other fun things) but also to some of Rachmaninov's works, including his piano concertos and songs . The middle section of the movement gives ample opportunities for chamber music between the piano and various solo instruments (in turns bassoon, clarinet, oboe and first violin) before a potent fugue-like section (sempre al rigore di tempo) eventually takes over. The second subject (L'istesso Tempo. Marciale) appears both in the exposition and recapitulation (just like it does in the finale of the original version of Rachmaninov's Fourth.) This march includes a clever, typically Medtnerian rhythmic feature: the piano is in 3/4, countered by the orchestral accompaniment in 2/4. An accelerated version of the march makes up the majestic coda - presaged by a cascading cadenza - in which a triplet rhythm dominates in the piano while themes from previous movements are heard in the orchestra. You need a really good ear - or two - to discern exactly what is going on, however: the woodwind inverting the second subject of the first movement, and clarinets and first violins presenting augmentations of other themes from previous movements - while, simultaneously, entirely new material is being created. Making new stuff from old is something Medtner - and Rachmaninov - was exceptionally good at. While many pianists of the past (including Horowitz, who unfortunately only recorded one short piece) huffed and puffed, expressing encouragement and support towards Medtner's work, hardly anybody actually tackled Medtner seriously. 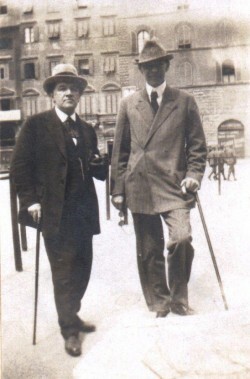 Moiseiwitsch did include some Medtner in his programmes and Gilels recorded two works, but otherwise he remained largely under-performed and under-loved. In the present day things are looking up, however, with Demidenko, Milne, Berezovsky, and Hamelin doing pioneer work in resurrecting his music. Why this concerto is not performed more often nevertheless remains a mystery and is nothing short of scandalous: it offers everything a pianist, or even a conductor, can wish for. As the work's dedicatee, it is just more bad luck for Medtner that the Fourth Piano Concerto has turned out to be one of Rachmaninov's least performed works. Apart from Michelangeli, none of the master pianists of the past championed this work like they did with his Third. Likewise the movie studios didn't find enough of the tear-jerking potential of his Second in it (even though occasionally one can tell where some of John Williams' ideas have sprung from). What's worse, the concerto in its glorious original 1926 version is almost unheard of. There are in fact three versions of the concerto in total. The original version of 1926 had an unsuccessful première in Philadelphia in 1927, with Rachmaninov immediately starting to make numerous cuts and amendments before publishing it in 1928. The critics had their 'fun' with it, for instance Pitts Sanborn in the New York Evening Telegram: The concerto in question is an interminable, loosely knit hodge-podge of this and that, all the way from Liszt to Puccini, from Chopin to Tchaikovsky. Even Mendelssohn enjoys a passing compliment. The orchestral scoring has the richness of nougat and the piano part glitters with innumerable stock trills and figurations. As music it is now weepily sentimental, now of an elfin prettiness, now swelling toward bombast in a fluent orotundity. It is neither futuristic music nor music of the future. Its past was a present in Continental capitals half a century ago. Taken by and large-and it is even longer than it is large-this work could fittingly be described as super-salon music. Mme. Cécile Chaminade might safely have perpetrated it on her third glass of vodka. Others called it 'long-winded, tiresome, unimportant, in places tawdry, amorphous and difficult to grasp on a single hearing...' - adjectives very similar to those used in spiteful descriptions of many of Medtner's works, which is somewhat ironic, given the dedication. Rachmaninov subsequently lost whatever was left of his confidence and withdrew the concerto until he attempted a final and most extensive revision in 1941 reducing the concerto from a total of 1016 to just 902 bars; most of the cuts are in the final movement. Unfortunately even this did not aid its popularity. It is my opinion regarding many of Rachmaninov's revised works (e.g. the Second Piano Sonata and the Second Symphony), that he should have stuck to his guns as the original versions are usually superior, in terms of both form and emotional impact. The Fourth Piano Concerto is a case in point: in its original version a truly epic work and, as an added 'bonus', much more insanely difficult than the revised version. I find the revised version too truncated; it has lost its violent contrasts of musical ideas, particularly in the Finale, where the Dies Irae-tinged theme has been removed almost completely and the severe rhythmic abnormalities (often quoting or teasing Medtner) have largely been ironed out (probably resulting from conductors' complaints!). The harmonies are less pungent in the revised finale, and Rachmaninov cuts out the return of the second subject, so that instead of an unstoppable, psychedelic coda - which requires such rhythmic precision that if you blink in the wrong place, everything immediately falls apart - he inserts one of his trade-mark 'big tunes' towards the end, a feature evidently intended as a crowd-pleaser, and also present in his overwhelmingly successful Second and Third Concertos. The feeling of 'bits'n pieces' occasionally experienced during the concerto can partly be attributed to Rachmaninov's sudden departure from his motherland. Rachmaninov, like Medtner, usually conceived compositions in their entirety: 'I go for a long walk in the country. My eye catches the spark of light on fresh foliage after showers, my ears the rustling undertone of the woods. Or I watch the pale tints of the sky over the horizon after sun-down and they come - all voices at once.' Unlike Medtner, however, he quickly yielded to adverse opinions and doubts would set in even before the ink was dry. There are indications that he may have begun working on the concerto in Ivanovka (his country retreat for divine inspiration south of Moscow) as early as 1914, before departing Russia for good in 1917. Had he not left, the concerto, probably in a somewhat different shape or form, might well have been premiered already in 1919. The eight years that followed his departure were instead spent away from composition: in order to support his wife and two daughters Rachmaninov was mainly occupied with touring. Towards the end of 1925 he took a sabbatical, however, working on the Fourth Concerto. Soon after he wrote to Medtner expressing his worries about its length, complaining that it would have to be performed on consecutive nights, like Wagner's Ring. As always a true friend, Medtner disagreed wholeheartedly: considering the importance of the work, he was amazed at the 'fewness of the pages' and maintained that Rachmaninov didn't suffer from fear of length but from fear of boredom. Another friend and colleague, the legendary pianist Josef Hofmann, also praised the concerto and hoped that, even if its frequent metric changes might make playing the piece with an orchestra difficult, this would not prove an obstacle to future performances. In spite of all this support and encouragement, the concerto remains a rare beast in concert halls, and the original 1926 version stays abandoned with the status of an obscure curiosity.